Well done, Bob! I can see a lot of research went into this work, and the manual is on par with anything that was written for BAT thus far! Two thumbs up!!! Thank you. Thank you very much, Ron. All this work is worth if it pleases IL-2 users like you. I'm sorry that my real job keeps me busy and away from IL-2. 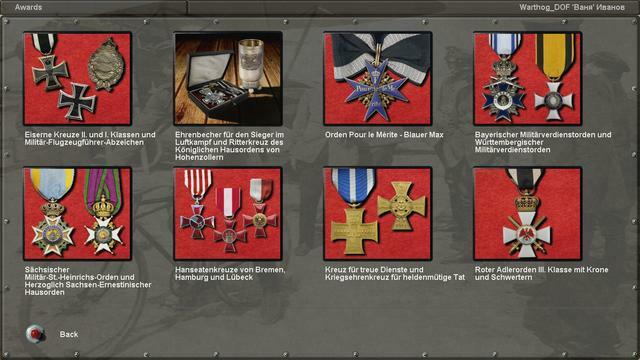 I am now working on German medals, but the task is complex and time consuming. I hope I finish it soon. 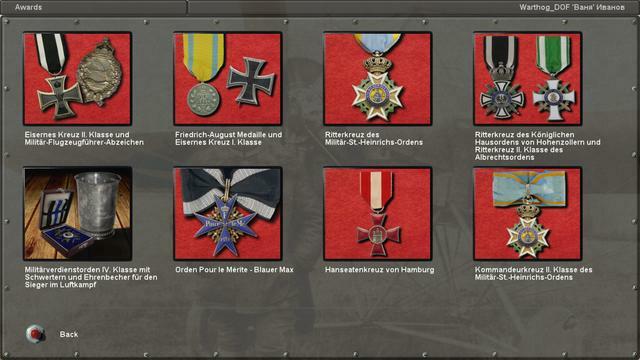 Does anyone have a good German medal set with awards.properties file? Well, here's what I made then. Thank you for your work and time. Well, finally I finished the German set!!! I'm sorry for the long delay, but preparing this set was rather hard, I spent one month abroad, and also my job and family demand some time. Thanks to vampire_pilot for sharing his work. However, I wanted to finish my part in order to keep the same 'art-style' in all my award sets. 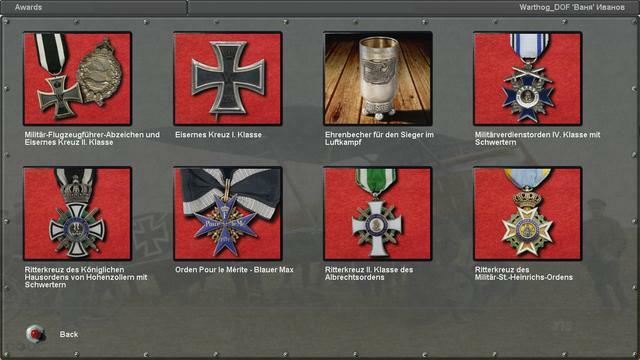 As other IL-2 users had reported, the German award system is very confusing, because after German unification, many states still preserved their own medals, and they were awarded generally to residents or native to these states. Moreover, I think that the German Air Service had a very 'individualist' character, at least much more than British Air Forces. That resulted in a set of rather 'unique' careers for German pilots, so it is difficult to make a common scheme for them. So I decided to prepare a standard set that could fit to any German pilot, but at the same time I didn't want to forget real legends such as Manfred von Richthofen and Max Immelmann. Thus, I also made special sets that fit as best as I could to these famous aces. You can select them via JSGME, and revive their outstanding careers. I went with the cup as first as this seemed to have been awarded for first aerial victories usually and set the Pour le Merite equal to the Knights cross on position 4 so it's not impossible to reach with the campaigns we have at hand. Awards 5 - 8 are almost all out of reach in the campaigns we have I think. Thank you vapire_pilot. Yes, now we have different sets of medals to choose. In fact, I thought of adding your set as a JSGME additional option, so the user can select whatever option we wants just with a click. If you don't mind, I can update my sets to include yours. Concerning the possibilities of the player to obtain most of the awards, you are right too. I've tried what I think is a good solution. It consists in joining two Monty's campaigns together, provided they belong to the same service and year. For example, French 1914_DEMARCATION and 1914_RACE. Thus, you have twenty missions for the same campaigns, and more opportunities to obtain the necessary points to get medals. However, as you say, awards 5 - 8 are too 'expensive' and it is almost impossible to get them. To solve this, campaign makers should design missions in which the amount of points obtained in each mission is progressively higher and higher. This would be very difficult by bringing down planes or bombing targets, but it can be done by placing a lot of primary targets (about 10-20 or even 50) one above the other in some strategic places (say, at the airfield as landing targets, or reccon places). Once the player 'touches' these targets, he obtains enough points to get the last medals. I don't think it is cheating, just remember that some WWI pilots were awarded with a medal just by making a succesful reccon mission. , just remember that some WWI pilots were awarded with a medal just by making a succesful reccon mission.